HomeProductivity Tips Effective use of time Outsourcing Outsourcing Tasks — Do It Myself Or Give It Away? Outsourcing Tasks — Do It Myself Or Give It Away? Have you ever wondered why, in spite of all the “time-saving” devices we have today — apps, technology tools, and “instant” everything — we are inundated with too much to do coupled with too little time to do it in? A solution? Outsource jobs, tasks, or responsibilities that need to be done, but not necessarily by you. Hire extra hands to help with the lifting, freeing you up to attend to other things. Sometimes outsourcing makes sense while other times it doesn’t. You might be surprised to find that you can outsource more than you realize. Professional outsourcing options can include: Accounting, IT, PR and advertising, recruiting, web design or even a productivity specialist (ahem, ahem). How many of these areas do you currently outsource professionally? What about personal outsourcing options? Baby sitter, dry cleaners pickup and delivery, house cleaning, meal preparation, personal trainer, yard work or seasonal plantings? These outsourcers can be a huge help with work/life balance! 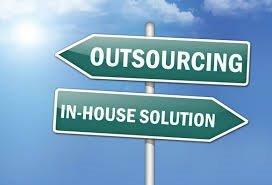 Our guess is that you outsource at least one, if not a lot more of the areas mentioned. We’re sure you would agree that we often count on the skills from others to get our job done. 1)　Missing Expertise – You could possibly learn the skill (and maybe you will at some point) but, at the moment, it is not one of your strong suits. For instance, we depend on a website guru. 2)　Time – You may be better off focusing on areas that bring in revenue and leave value-added tasks to people who do it for their day job. For example, many people count on a virtual assistant to handle administrative work remotely. 3)　Resources – You may be missing the hardware, software or equipment needed to perform the task. Have you seen the size of facilities for off-site physical document storage? 4)　Financial Impact – Weigh the outsourcing cost against your hourly rate. If you don’t know your hourly rate, take your salary and divide by 1080 (52 weeks x 40 hours/week) to find out your hourly rate. This is a good thing to know anyway. 5)　Prefer Doing It Yourself – Use your time wisely. As long as the task does not take a lot of time and you enjoy it, then it may be a task to handle on your own. 6)　Internal Resources – Take advantage of in-house staff, if available. As an example, if you have in-house counsel, outside attorneys are less likely to be needed. What else can you outsource? What would be the impact of more outsourcing on your ability to achieve goals, manage time, and potentially reduce your work hours? What’s holding you back? If you have trouble finding good outsourcing options, ask your social media networks for recommendations. If you are a member of　professional associations, you’d be surprised what outsourcing resources those can provide. If you or someone you know is a member of Business Networking International (BNI), then you have a huge source of vetted professionals to whom you can outsource. To do it yourself or to get help is not always an obvious decision. At some point soon, we all face this. Please let us know what you outsource and how it has benefited you. Great article! In my opinion, outsourcing can help a company become more productive and efficient by lower costs, such as time, stress, and money, later on down the road. Thanks for sharing! Glad that the article about outsourcing was helpful. You’d be amazed at the number of clients we work with who hesitate about paying for outside expertise. As you point out, it pays off for a company as it grows.